Worm composting has been popular for decades. A pound of red worms can eat 65 pounds of food trimmings in less than three months. The worm castings, or vermicompost, are a high-quality soil amendment that can be used for house and garden plants. The basic difference between a backyard compost bin and a worm compost bin is what you put in your bin. A backyard bin is for composting plant trimmings, or plant trimmings combined with fruit and vegetable trimmings. A worm bin is designed for composting only fruit and vegetable trimmings. Worm bins are generally much smaller too, so they're a good option for households with limited space. 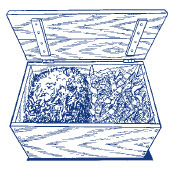 Maintaining a worm bin is easy, but it's a little different than a backyard compost bin. Read on for how-to hints and watch the video at the bottom of the page. 1. Buy a Bin or Build One. Build out of wood, plastic, an old dresser drawer, shipping crate, or barrel. Your bin needs to be 10 to 16 inches deep, have holes in the bottom or sides for ventilation, and have a snug-fitting lid. To keep rodents out, the holes need to be 1/4 inch or smaller. The rule of thumb for bin size is two square feet of surface area per person. An average two-person house would need a bin about 4 square feet, or two bins that are 2 square feet each. Locate your bin where it will not freeze or overheat — in a pantry, kitchen corner, laundry room, garage, basement, patio, deck, or in your garden. 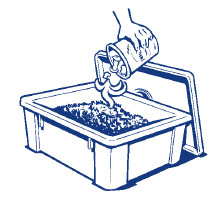 Outdoors a worm bin should be located out of the direct sun. The hot rays of the sun can heat up a worm bin and kill the worms. During winter, it is important to provide protection from rain or frost. 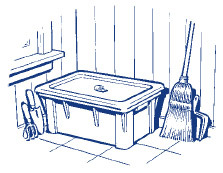 Worm bins are often placed in garages, under decks or basements. 3. Make a Worm Bed. Worms like to live under lots of moist paper or leaves. This helps keep them cool and moist, gives them fiber to eat, and prevents fruit flies from getting to their food. To make your worm bed, tear black and white newspapers into one-inch strips, fluff them up, then moisten them with a spray bottle so they are completely wet but not dripping. Fill your bins three-quarters full with this moist bedding. Shredded cardboard, leaves, compost, sawdust, and straw can also be added in as bedding. Do not use glossy paper or magazines. Sprinkle bedding with a few handfuls of soil. Compost worms are often called "red worms" or "red wigglers." Their scientific name is Eisenia fetida. They are different from earthworms and nightcrawlers, which live underground. You can find red wigglers in an old compost pile, get them from a friend's worm bin, or buy them from a worm farm. Start with one half to one pound of worms, or two nice big handfuls. Give your worms about a quart (one pound) of fruit and vegetable trimmings, then leave them alone for a couple of weeks while they get used to their new home. After that, feed your worms about a quart of food scraps per square foot of surface area in your bin per week. To avoid fruit flies and odors, bury food under the bedding. 6. Maintain Your Worm Bin. Always keep a 4- to 6-inch layer of fresh bedding over the worms and food in your bin. Add fresh bedding every time you feed the worms. Keep bedding as moist as a wrung-out sponge. In a plastic bin, add dry bedding to absorb excess moisture. Wooden bins may require adding water occasionally. 7. Harvest and Use Your Worm Compost. You can start harvesting worm compost 2 to 3 months after you set up your bin. Simply reach in and scoop out the brown crumbly compost, worms and all. You can also move the contents of the bin to one side, place fresh bedding and a handful of soil in the empty space and bury food there for a month or two. Harvest the compost after the worms have migrated to the new food and bedding. To keep your worms healthy, harvest at least once a year. By adding nutrients and humus to the soil, worm compost will help your plants thrive. 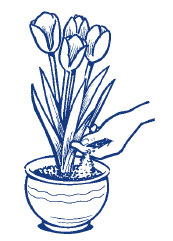 Sprinkle a 1/4-inch to 1-inch layer of worm compost at the base of indoor or outdoor plants, or blend no more than 20 percent worm compost into potting mix or garden soil. Barbara Finnin, a Master Composter, goes over the basics of worm composting in this video produced by Freshtopia.